I’m extremely passionate about giving people proof to help them understand that we do not, and cannot die, but that we simply move on to a different and better place, still remaining around our loved ones. Through this understanding, many are able to face their own death without fear, and to cope with grief a little more easily, knowing that their loved ones remain close to them and are only ever a thought away. I’d like to take the opportunity now to tell you a little bit more about myself and the way I work; basically to try to explain how I am able to offer this incredibly important proof to people. Psychic and mediumistic abilities have quite simply always been a part of my life. For as long as I can remember I have had my ‘friends on the other side’ and as I’ve grown and matured, this has become a more and more important aspect of my life. It’s been a long and sometimes difficult path to tread between my early childhood (when I was told I would be carried off to the asylum if I carried on communicating with my ‘friends’) and the present day, where I devote much of my life to trying to reach and help people with my unusual gift wherever possible. My work as a medium has been evolving and developing for as long as I can remember, and you can read more about this in my book. Basically though, I work through what is known as ‘clairsentience.’ I don’t hear voices like Steve Holbrook, I don’t often see spirit, but instead messages, names, dates, places, pictures, are put into my head as thought forms. I have to rely on trust, as I give words to what is put in my head as thought, but I am continually rewarded with confirmation that the names and the detailed messages I bring through have great meaning to the recipient. My work as a psychic artist though is relatively new, and only became apparent to me in 2007 as I was approaching my 60th birthday. It was totally unexpected (particularly as I have absolutely no artistic ability) and it is fair to say that I ‘discovered’ rather than ‘developed’ this talent. It started when I began to notice noses, mouths, ears and incredibly lifelike eyes staring up at me from scraps of paper scattered around the house. I then slowly realised, much to my surprise, that it was me who’d absent-mindedly drawn them. But I only began to understand the significance of what (and who!) I was drawing when my hairdresser gasped “that’s my granddad,” referring to the portrait that I was drawing on the sketchpad in my lap, as the colour set on my hair! Since then, I’ve drawn and sent out thousands of portraits to people all over the world, all but a very tiny number of which have been identified as loved ones who have passed over, and frequently matched to photographs. It is a phenomenal thing to have happen through my hands, and as I can be a real sceptic when it comes to many of those professing to be ‘mediums’ it is amazing and incredibly important to me that I have a gift which allows me to leave a tangible piece of evidence in the recipients hands. My psychic art continues to amaze me in every sense, and as I am frequently asked “how do you do it?” I will try to explain. It’s quite simple really. I don’t. 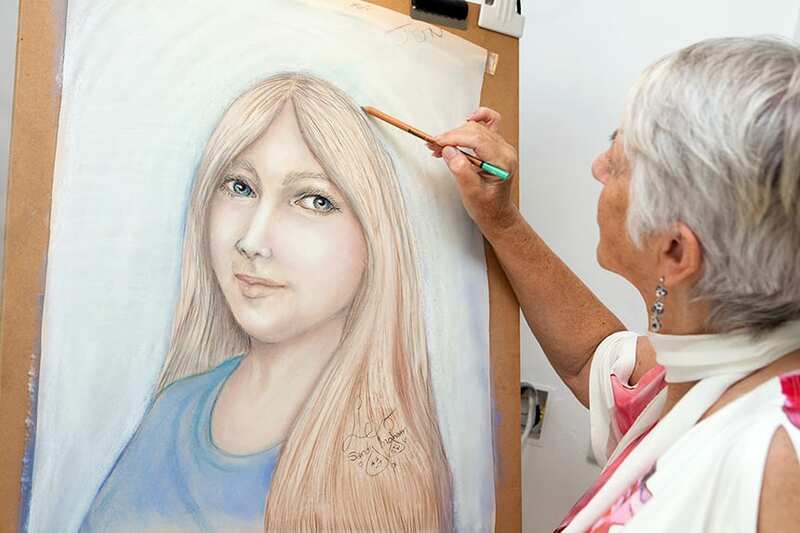 My spirit guide, who was himself a well-known artist in his time, is able to work using my hands to produce accurate portraits. I don’t see the faces of those that I am drawing, and can only explain that your loved ones sit not for me, but for my artist in spirit, as their pictures take shape. Often, I’m asked to bring through the likeness of a specific person, and very often I am able to. The drawings are nearly always incredible likenesses of close family members in spirit; mums, dads, sisters, brothers, children, grandparents. However, the truth is that I have no real control of who comes through. I have even drawn people who will be significant in the future, and on a couple of occasions sent a likeness of the person requesting the picture! This is because characters don’t change – if he or she didn’t like having a picture taken when they were living, chances are that’s still the case, so sometimes pictures of living family members are brought through as proof instead. Sometimes, a portrait that I draw will not be immediately recognised, but the recipient will say that it has ‘a look of’ their dad. I tell them to take it home, show family members, mull over memories, browse through old photos, and let me know. A phone call usually soon comes through to tell me that mum recognised it immediately, dug a photo out of her attic that matches the portrait, and that it is of dad when he was just 35 and you were just a toddler. Why does this happen? Would you like to be remembered in the prime of your life, sitting with your family when you were at your happiest, or in your frail dotage? Particularly in cases where people have passed to spirit as a result of old age or illness, they rarely want to be remembered like that, so will be drawn as they were in happier times, and frequently when they were much younger. My work continually amazes me and I give thanks for my gift every single day. It is so humbling; a real privilege to be allowed this insight into people’s lives, and to be able to help in whatever way I can. Being able to demonstrate my gift in front of thousands of people as I tour the country with many wonderful mediums this allows me to reach even more people, and to bring some comfort wherever I can. I know first-hand how cruel grief can be – the crushing loneliness, the heart-breaking reminders of loss when you’re least prepared. Through my mediumship and psychic art I can at least offer real, tangible proof of ‘life after life’ and give people the comfort of knowing that their loved ones are still there with them, guiding them and giving their love every step of the way.